The basic hose with wooden tip by mya saray supplies your hookahs with a very convenient type of hookah hose. This narguile pipe accessory is washable, making it perfect for hookah lounges as it saves time on cleaning all your accessories and promotes sanitary smoking environments. 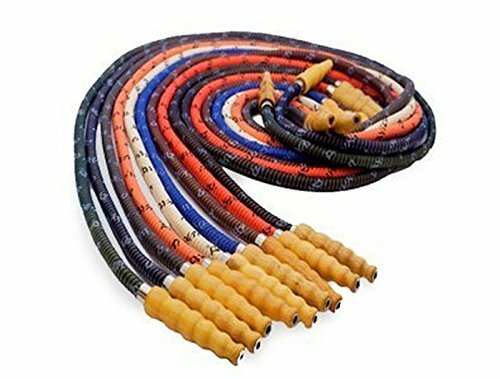 Made in china, the basic metal tip hookah hose is 72" long and proves to have truly unique parts and pieces, as the inside lining of the hose is made of a durable synthetic leather material that will not deteriorate in quality. To avoid rusting, the mouth tips are made out of a wooden material and are coated in order to repel water. In addition, the thickness of the shisha pipes hose allows for the smoke to pass through easily and effortlessly, making your hookah smoking experience even more enjoyable. (Includes 1 hose).